How to become a glider pilot? Your first step is to take an introductory flight in a sailplane. That flight will introduce you to a world you have never known. And it is so exciting that you will want to explore it, to learn more about it and to become part of it. Accept that challenge and you are on your way to becoming a part of the world of glider pilots. As with any course of study, the more material you read on your own, the faster you'll learn and the more competent you'll be. The Soaring Society of America Online Store, commercial glider schools and book dealers listed in Soaring Magazine can provide textbooks containing all the theory and essentials of flight, soaring techniques, safety, navigation and meteorology, as well as the Federal Aviation Regulations you will need to know to pass the FAA written examination. You will be studying this material while you are taking your flying lessons. After you have passed your FAA written examination, your instructor will recommend you to take the Private Pilot Glider oral and flight test. Passing this test will entitle you to take passengers for rides. Lessons can be scheduled at your convenience. The closer together the lessons are, the easier it is to build on the knowledge gained from previous lessons, and the faster you will learn. Most people try to fly at least once a week, and most prefer to take more than one flight during each lesson. The sailplane you will fly has dual flight controls, and your instructor will sit behind you. Your instructor has all the directional controls that you have and will show you the control motions or follow along with you as you are learning to guide the sailplane. If you have not flown before, some of the maneuvers and coordination may seem a bit difficult at first. After a few flights, however, you will be making the sailplane do what you want it to do, and you will wonder why you ever felt so clumsy on your initial flights. You will learn that a sailplane is a docile yet responsive machine that answers to gentle, coordinated pressures on its controls. You'll learn to fly the sailplane straight-and-level, to turn it in varying degrees of bank, and to recognize and recover from stalls. You will practice flight courtesy and safety, and will glide down to enter the airport traffic pattern at a predetermined altitude. You will fly your approach precisely, land your craft with its wings level, and stop where you want to stop. You will learn emergency techniques so there will be no unexpected surprises for you when you become a licensed pilot. How long it takes you to solo depends on a number of factors. These might include any previous pilot experience you have had, how open you are to your instructor's guidance, and how relaxed you are. Other factors include the type of sailplane you are flying, the weather during your training, and the degree of experience and proficiency your particular program of training requires before permitting you to solo. The requirement for an airport located on an uninterrupted plain in Kansas might well be different from the requirement for an airport cut out of a forest of Joshua trees. You can solo if you are 14-years old or older. Most instructors feel that 30 to 35 flights are the minimum needed for most people with no previous flight experience. An experienced power (airplane) pilot can generally solo a sailplane in less than 10 flights.Gliders and glider pilots are regulated by the Federal Aviation Administration (FAA) who set the minimum requirements for pilot certificates. Cost of training from beginning through solo at a commercial gliderport will vary depending upon where it is and how rapidly you progress. After you have soloed, you will continue to fly with an instructor from time to time to see that you are maintaining good flying habits and developing your judgment and flying skills. Learning to fly a sailplane safely is easy. The instructor can teach you the mechanics of flying the glider in just a few lessons. But don't be led too quickly into thinking that you have learned all there is to know. Learning to soar is a series of steps and plateaus. How high on that ladder you wish to climb is up to you. Some pilots are content to soar around an airport. Others find exhilaration and satisfaction in cross-country flight and ultimately in competing with other pilots. Learning while flying is fun; a fine balance of determination, flexibility, and practice is necessary to gain the proficiency you will need to get the most out of your sailplane. Aero tow launches are the most widely used method of getting a glider airborne in the U.S. today. The sailplane is pulled aloft by a 200 foot nylon or polypropylene rope secured by a special hook to the tow plane. The sailplane pilot can release the tow rope at any altitude desired. In the unlikely event of a sailplane release mechanism malfunction, the tow plane pilot can release the tow line. Auto launches are sometimes used. A 1000 foot rope connects the sailplane to a special hook on the towing automobile. 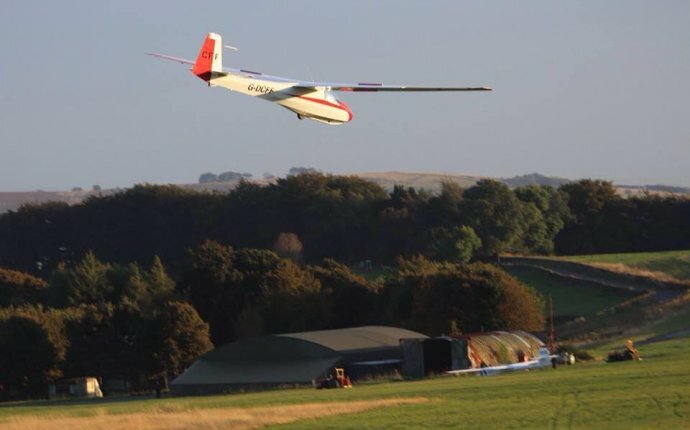 When the signal is given, the tow vehicle drives down the launch runway and the glider pilot flies the glider up to an altitude of 800 feet or so, then releases the tow line which falls gently to earth. Winch launches can achieve altitudes of 500-2000 feet before release, depending on the length of the winch line and the wind strength. Auto and winch launches are less expensive than aerotows; however, to conduct them safely, they do require a several member crew. - How to Become a Navy fighter pilot?